We are back! 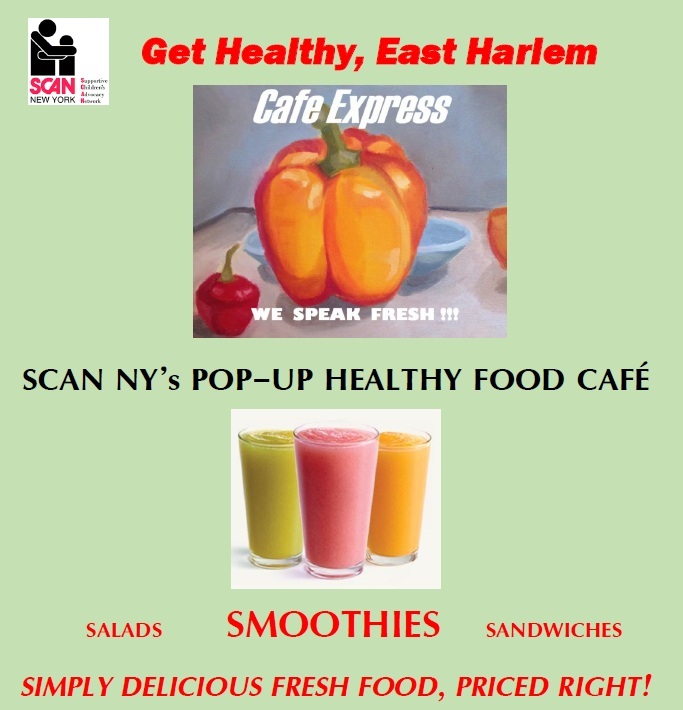 SCAN’ NY’s NYCHA resident run “Cafe Express” Healthy Food Pop-Up Cafe Events at SCAN NY’s Lehman Cornerstone Center, 1589 Madison Ave, at the corner of East 107th Street. All events are open to the public. “Cafe Express” is part of SCAN’s Get Healthy, East Harlem program, with NYCHA residents planning and performing key aspects of each cafe event, including creating the menu, cooking, and marketing the events. We invite you to join us for a healthy mix of salads, sandwiches and smoothies! And stay tuned for more “Cafe Express” dates!! !